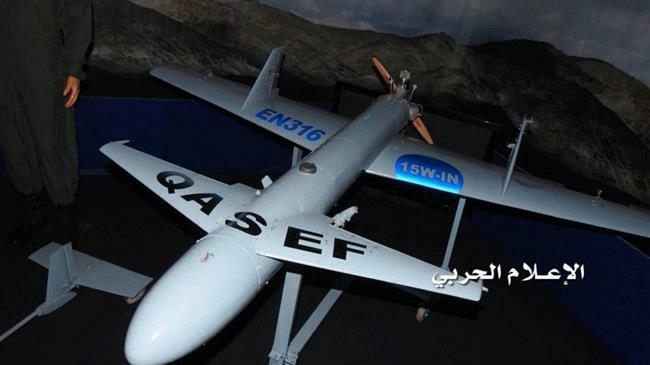 This file picture provided by the media bureau of Yemen’s Operations Command Center shows a domestically-designed and –manufactured Qasef-1 (Striker-1) combat drone. Sana’a(ANN)-Yemeni army soldiers, backed by allied fighters from Popular Committees, have reportedly launched an airstrike against a strategic economic target in the United Arab Emirates in retaliation for Riyadh’s devastating military aggression against their impoverished homeland. A Yemeni military source, speaking on condition of anonymity, said Yemeni soldiers and their allies attacked Abu Dhabi International Airport using a domestically-built long-endurance Sammad-3 (Invincible-3) unmanned aerial vehicle. Meanwhile, Abdullah al-Jafri, a spokesman for Yemeni air force and air defense, said the drone attack on Abu Dhabi International Airport had halted flights to and from the airport, adding that this was the first time that Yemeni forces used a drone to attack the airport. Emirati aviation authorities later announced that an incident involving a supply vehicle in the Terminal 1 airside area of the airport had occurred at around 4 p.m. local time (1200 GMT). The officials, however, claimed that the development had not affected operations at Abu Dhabi International Airport, and flights continued to arrive and depart as scheduled.